Is the ‘Third Epidemiological Transition’ upon us? 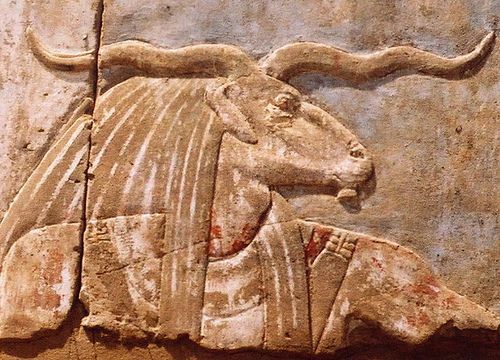 Khnum, the Egyptian ram-headed god who created man from clay (from Elephantine Island, in Aswan, southern Egypt). The first epidemiological transition occurred some 10,000 years ago, the paper reports, with the invention of crop agriculture, the domestication of farm and herding animals and the associated rise of human settlements, which led to a surge in zoonoses and other crop-related diseases. The second transition occurred in recent decades, as more effective drugs, vaccines and diagnostics led to a steep decline of infectious disease, such as mastitis in dairy cows, with noncommunicable diseases replacing infectious diseases as the most significant health burden in many countries. Today, the authors argue, globalization, ecological disruption, population growth and the on-going ‘Livestock Revolution’ may be driving a new era of disease, one that could dramatically reduce human and animal health both. The authors of the PNAS paper, Current drivers and future directions of global livestock disease dynamics, say it’s clear that both the distribution and the emergence of diseases are changing. Although control and management of many endemic diseases in rich countries have improved, new diseases such as BSE and HPAI have emerged. as occurred in the first epidemiological transition (associated with neolithic sedentarization and the domestication of livestock), the worst of the emerging diseases are likely to be zoonotic. 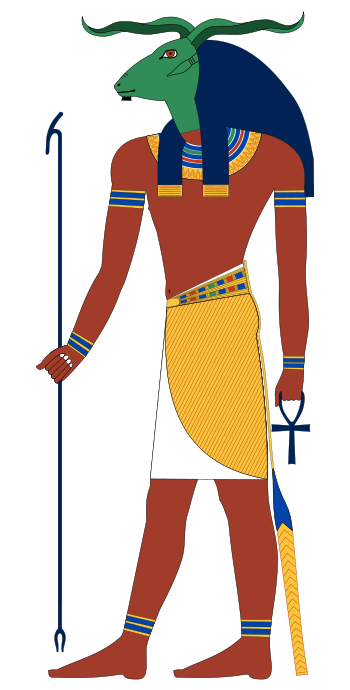 Khnum, an ancient Egyptian ram-headed god who creates people, based on New Kingdom tomb paintings (illustration by Jeff Dahl/Wikipedia). The authors describe three global disease trajectories influencing zoonotic disease threats in the world today. The first is the livestock-related health risks in wealthy countries among the ‘worried well’. Here, the researchers find that while the incidence of many diseases has been reduced, the concern over disease has actually grown. High-profile livestock-associated diseases such as bovine spongiform encephalopathy (BSE), popularly known as ‘mad cow disease’, shocked rich-world disease authorities out of their complacency in recent years, the authors note. In these countries overall, there is a steadily improving approach to disease control and management. The main zoonotic disease risks in wealthy countries are in the form of drug resistance (linked to overuse of drugs in industrial livestock systems) and the economic harm that can result from livestock-related disease scares. Livestock diseases and zoonoses associated with urbanization are becoming more important, and literate, media-aware, and connected urban populations are demanding more control of zoonotic and food-borne diseases. At the same time, the dramatic increase in the mobility of the world’s population (for example, the over sixfold increase in air passenger travel between 1990 and 2007) is challenging for effective control of movement-associated diseases. A second disease trajectory is found in China and other rapidly developing countries, where livestock production and marketing have exploded in recent years. While the risks of outbreaks of zoonoses and the emergence of new zoonoses, such as highly pathogenic avian influenza (HPAI) and severe acute respiratory syndrome (SARS), are both rising in these countries, the latter’s capacity to meet international animal health standards is generally inadequate. In summarizing the relative importance of different drivers of change, the most important issue here is the rapidly increasing demand for livestock products and marketing opportunities in developing countries, which is fueled by population growth, urbanization, and increasing incomes . . . .
A third disease trajectory is occurring in Africa and other of the poorest regions of the world. While the intensive livestock production systems associated with the emergence of new zoonoses are uncommon in these regions, inadequate disease control measures, infrastructure and expertise keep livestock and people vulnerable to existing (largely preventable and curable) diseases, which periodically flare into epidemics. If disease trends at the macro scale remain controversial (with some proclaiming that we have never had it so good, whereas others warn of the impending perfect microbial storm), in the here and now, disease is demonstrably changing in spatial distribution and emergence. The authors warn that in an increasingly globalized world, deepening ‘the existing balkanization of livestock health status’ threatens global stability. They call for action on two fronts. The first is to speed convergence of livestock health practices between emerging economies now rapidly intensifying their livestock production systems and wealthy nations that have already adopted effective measures for controlling ‘diseases of livestock intensification’. In poor countries, the researchers advocate directly linking livestock health investments to poverty-reduction programs. Underlying these trajectories is the determined and steady global trend to greater intensification of livestock systems and the benefits and challenges that it brings to animal health status. Threatening this trend is the risk of a third epidemiological transition and dramatic deterioration of animal and human health as the result of emerging and reemerging disease. Additionally, in the background is the significant component of the world’s livestock enterprises in the hands of the very poor, for whom intensification is just not a realistic option and who are likely to be most vulnerable to disease resurgence. Read the whole paper in the Proceedings of the National Academy of Sciences (PNAS): Current drivers and future directions of global livestock disease dynamics, by Brian Perry, formerly of ILRI and now of the University of Oxford; Delia Grace, of ILRI; and Keith Sones, ILRI consultant; 24 Dec 2014. Read an earlier review of the early online version of this paper on the ILRI News Blog: New PNAS-published study discloses the ‘hot spots’, ‘warm spots’ and ‘cold spots’ of global livestock disease risk, 25 May 2011. Tags: Brian Perry, Delia Grace, Keith Sones, PNAS. Bookmark the permalink.